overlooks Anaehoomalu Bay, Marriott's Waikoloa Ocean Club sets the stage for a memorable Big Island vacation. Here, pristine beaches, dramatic volcanoes and stunning tropical flora dazzle you at every turn. Plush villa accommodations feature flat-screen TVs, free Wi-Fi and kitchenettes. Relax beside one of three swimming pools, challenge yourself to a workout in the gym or play a game of tennis. Balance your activity with some well-earned relaxation at Mandara Spa and stop by the ancient Hawaiian fish pond for a moment of reflection. Enjoy a meal at Hawaii Calls Restaurant & Lounge and take in the sunset by the fire pit. 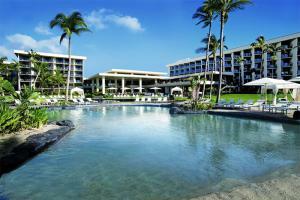 Located on Waikoloa Beach, approximately 19-miles from Kona International Airport.